Once again, I pulled this recipe from an online site, but honestly don’t remember where it came from. And I modified it enough, it doesn’t really even matter. I added veggies and extra spices to the cheese filling, and made my sauce a little chunkier. And I even switched from jumbo shells (or whatever the misleading name is, I mean the shells aren’t THAT jumbo) to manicotti because I think they’re somewhat easier to fill. So here it is. But make it your own! Bring a large pot of lightly salted water to a boil. 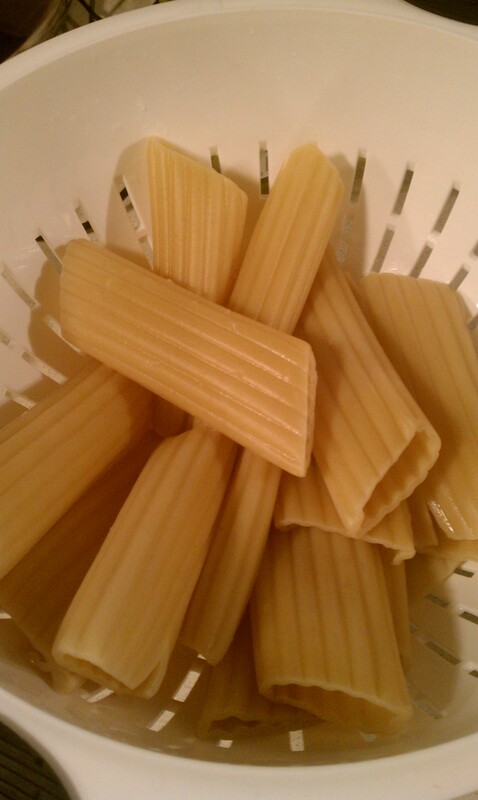 Add pasta and cook a few minutes short of done (they’ll cook more in the oven and when reheated after freezing). 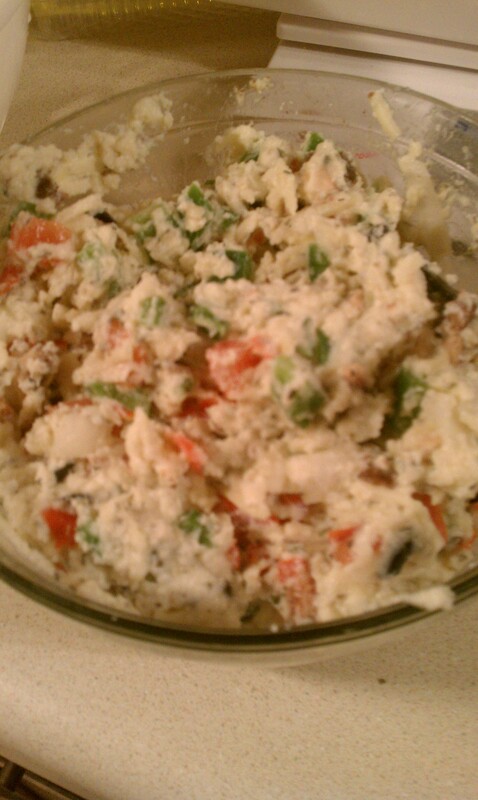 In a large bowl, mix eggs, ricotta, 5 ounces of the mozzarella, half the Parmesan, seasonings, ½ the onion pepper, half the mushrooms, black olives, and tomato until well combined. In a medium pan cook the clove of garlic, the other half of the onion and mushrooms until fragrant. Stir in the pasta sauce, tomatoes and about ½ cup of water. 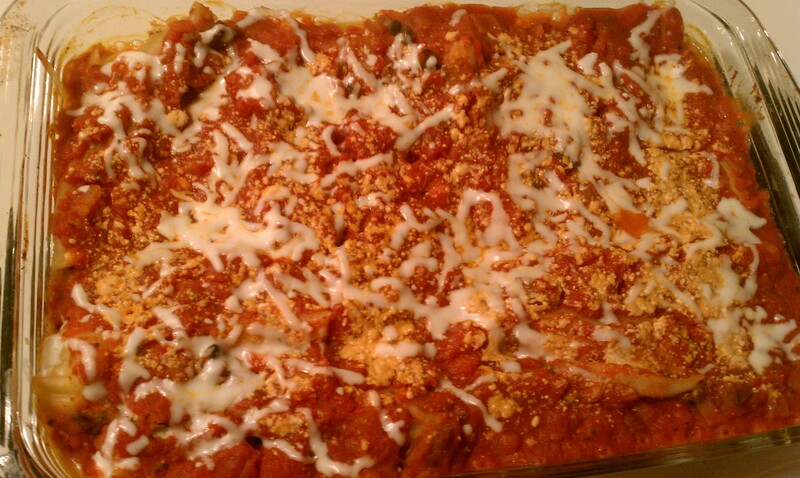 Bring to a boil then simmer while you stuff cooked shells with ricotta mixture and place in a 9×13 inch baking dish. If there’s extra filling, place between shells. 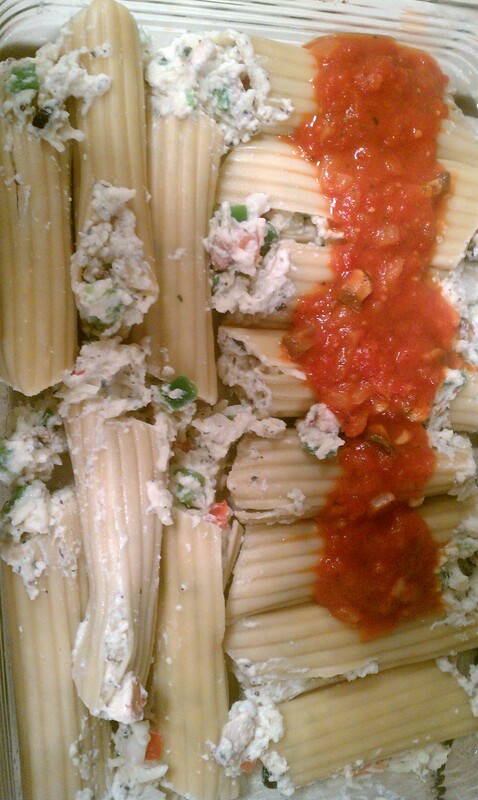 Cover the shells with the pasta sauce then top with reserved Parmesan. Bake, covered, in preheated oven 45 to 60 minutes, until edges are bubbly and shells are slightly set. Top with remaining mozzarella and bake, uncovered, until the mozzarella melts. 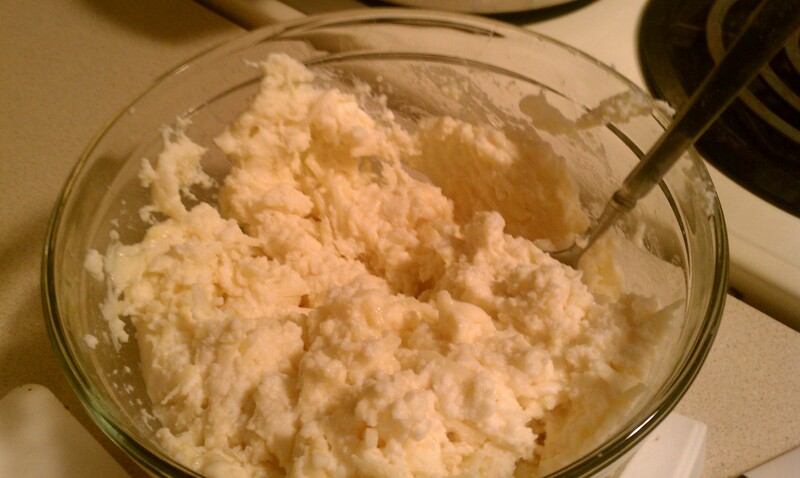 I started by mixing together the ricotta, mozzarella and parmesan cheeses together. I used about 4 or 5 ounces of the mozzarella because I don’t care about having the cheesiness on top of the dish because it all seems to clump together. I’d rather have it in the shells. You could obviously adjust this to your own taste. I did about half of the parmesan cheese. At this point, I mixed the egg in with the cheese but wish I’d done all of my spices before the egg. You know, why tempt salmonella when you don’t have to? I choose veggies I like. I always choose Italian veggies based on what I like on pizza. Read: almost everything. 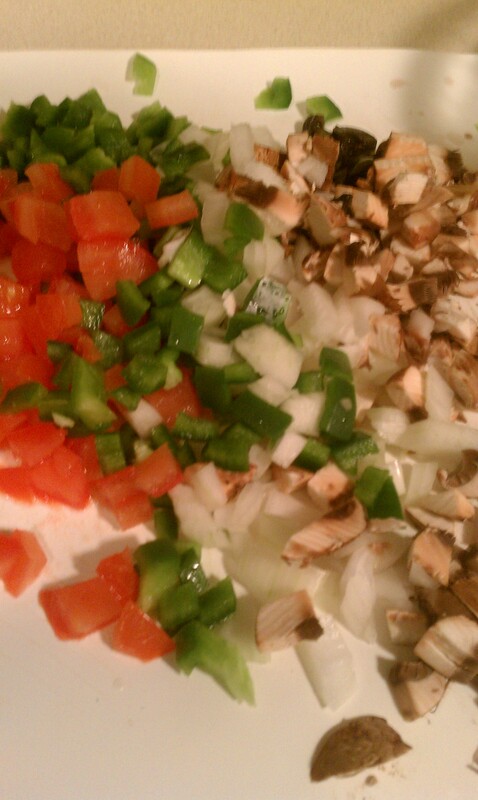 I had a green pepper, onion, mushrooms, black olives and a tomato on hand. I could see spinach being really good here. And if you’re not worried about meat, I think pepperoni, Italian sausage or ham would be good flavor, too! I diced everything really small. Mostly so that I would get lots of flavors in each bite. But also because I wanted the veggies to get mostly cooked in the oven. The manicotti said to cook for 7 minutes, so I cooked it for five. I hate it when I cook the pasta as directed then put it back in the oven and it gets all mushy. Five minutes was perfect in my case. Then the real work begins: stuffing. While I was stuffing these, I made my sauce. I added a can of diced tomatoes to a big can of garlic marinara sauce after slightly stir frying up one clove of garlic, half an onion and one baby portabella mushroom. 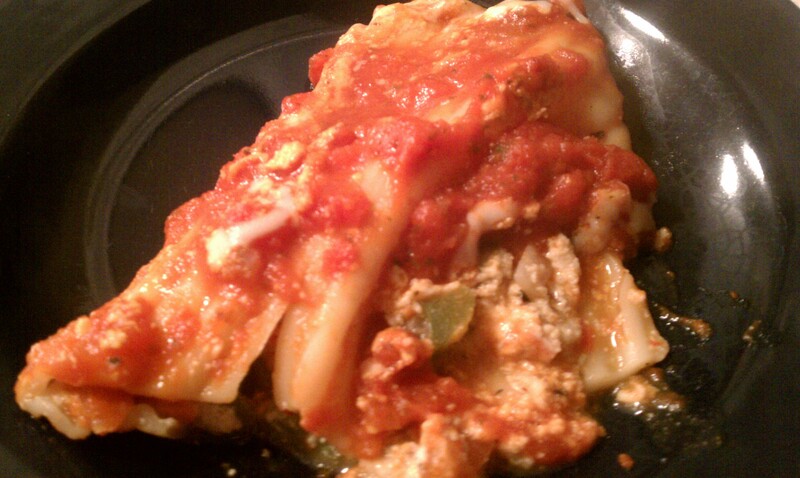 I added about a half a cup of water and let it simmer the whole time I was stuffing the shells. This gives me a little chunkier sauce, and I was afraid there wouldn’t be enough sauce otherwise, but was also afraid two cans would be too much. I strategically placed leftover filling post-stuffing in between shells. It’ll all get eaten, right? 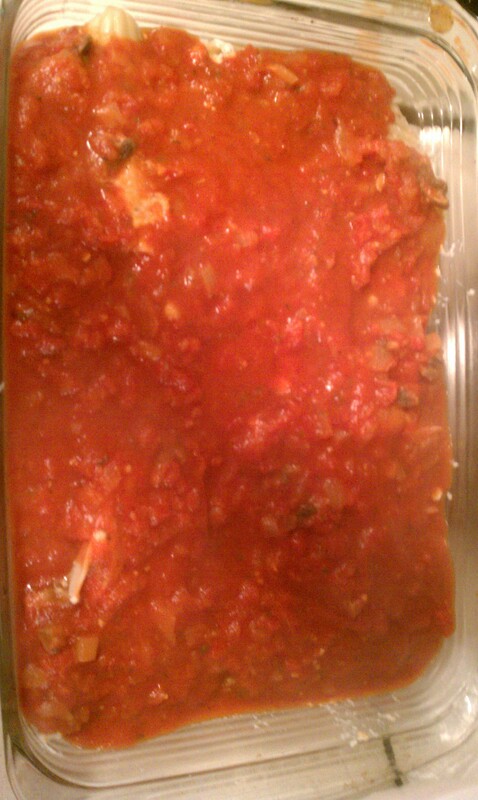 Spread the sauce evenly over the manicotti (otherwise the little fellas will get dry during cooking). Then I sprinkled the rest of the parmesan cheese over the top. Covered with foil and cooked for an hour at 350 degrees. With about five minutes left, I took it out, added the remaining mozzarella and let it cook until that melted. Like I said, there’s not much point for me to put the mozzarella on top. It would have been fine without it. Let me assure you, this smells DELICIOUS! There you have it. Let me assure you, the secret to this dish is the shell filling. Make sure you season the cheeses just right, and use veggies you love. I think we tend to under-use spices. I was pouring them in on this dish. It’s possible I used more than I estimated in the recipe. My suggestion would be to mix up all of the cheeses and spices and wait until you get the flavor you like before adding the egg and veggies. I set this recipe to make six servings. Those are very big servings and I think eight servings would have been plenty. I plan to take these for lunches and I try to make lunch one of my bigger meals of the day. So cutting this into eight servings would be great, too. Well, and I only had six storage containers. OK, that’s mostly the reason I did six servings. You got me. I admit it.